The first release of 1Q UK GDP was a clear disappointment. When published last month it reported growth of just 0.3% QoQ versus the 0.6% rate the Bank of England had been pencilling in. The fact that it has now been revised down to just 0.2% QoQ brings into focus the problems the UK economy is facing just ahead of the start of formal Brexit negotiations. The big concern has been the squeeze on household spending power caused by the fact wage growth is failing to keep pace with the cost of living. 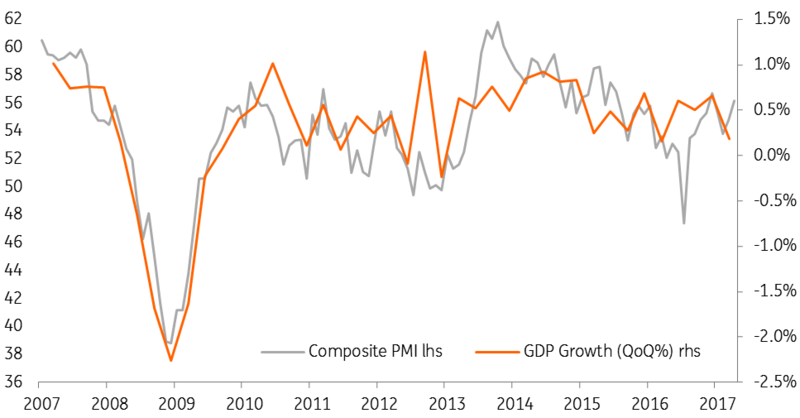 This suggests weaker consumer spending growth while Brexit-related uncertainty is likely to mean businesses are more cautious about putting money to work. This implies less hiring and investment spending in the economy. The one hope has been that the pound’s plunge would boost the competitiveness of UK exports that would also lead to a partial rebalancing of the UK economy. However, this wasn’t really in evidence in yesterday’s release. Investment spending actually rose 1.2% QoQ, the strongest rate of growth for nearly two years, whereas the net trade contribution acted as a drag on overall growth – imports rose 2.7% while exports fell 1.6% on the quarter. Then there is the government spending component. Despite austerity, it rose 0.8% QoQ, the strongest figure since 2Q15. The one area where the data made intuitive sense was consumer spending growth, which slowed from 0.7% QoQ in 4Q16 to 0.3% in 1Q17. We are hopeful that growth may rebound a touch in 2Q17 given business survey readings, but the trend is one of overall weaker growth. This really underlines the problems facing the British government in the Brexit negotiations, which are set to start within a couple of weeks of the election result. It also highlights the need for a fairly long transition period to help smooth the process and minimise any economic damage from Britain’s departure from the EU.